Facts and figures indicate a continuously increasing societal welfare. But what about its impacts on the environment? The growing wealth has been accompanied by environmental degradation, deforestation, losses in bio-diversity, global warming, air pollution, depletion of the ozone layer, and overfishing. Recent measurements have been performed related to the depletion of natural resources showing that humans currently use the resources of 1.25 Earths. At the current consumption levels of high-income countries, the world could only sustainably support 1.75 billion people, not the 6.5 billion living on Earth today. Fortunately ecological awareness is consensus today and reaches far more social levels than just greenies and do-gooders - see the LOHAS trend in this book as an example. Governments have recognized that environmental protection is a worldwide concern that can be solved solely through co-operation. Especially renewable energy has reached the top of the agendas of the United Nations, the G8, and other multilateral fora. At the last conference of the UN climate council the participants noticed that the technologies, required to limit the greenhouse gas emission, are available and affordable. Thus the framework for a change is established and available. It’s up to mankind to carry out the transformation. This book gives an insight into the current social transformation that is underway. Research indicates that societies are undergoing a decisive and formative value transformation, away from a pure materialistic and monetary mindset towards a lifestyle of health and sustainability and a better quality of life. Surveys also revealed that although people, especially in the developed countries, continuously got richer over the last 50 years they did not become happier. This finding was responsible that the science of happiness research experienced a tremendous increasing attention over the last 10 years and that even on governmental level the opinion became accepted that we have to go beyond GDP. Impacts of this value transformation are already visible today in several industries. 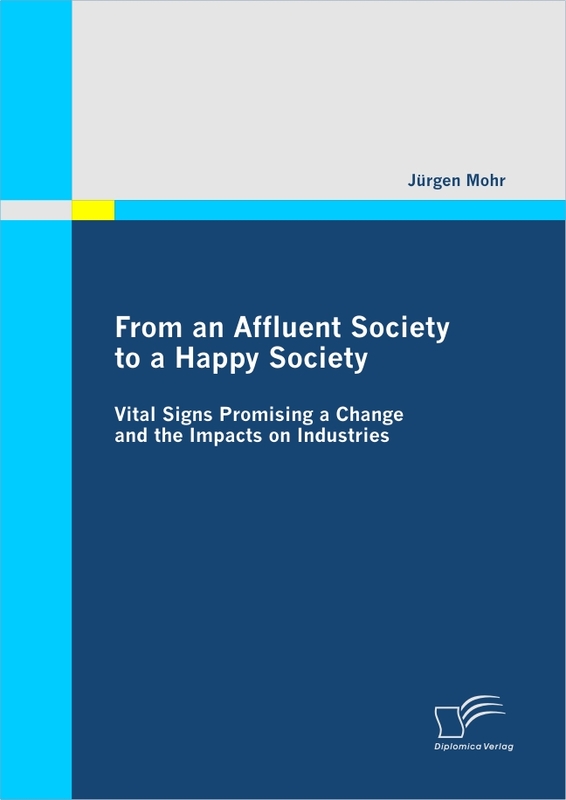 Starting with a brief description of the historical evolution of the industries, followed by some critical words about welfare and environmental pollution vital signs indicating that societies worldwide are going through a change are highlighted. A deeper look will be taken into the powerful LOHAS trend, corporate social responsibility, governmental and non-governmental initiatives - especially the discussion to go beyond GDP and the mighty upcoming science happiness research - and the remarkable boom of the renewable energies. Before concluding with a short summary, the impacts of that transformation on several industries are identified and described. Text Sample: Chapter 3.3,The Measurement Of Society’s Well-Being: Restrictions Using GDP: To determine the economic performance gross domestic product (GDP) is the best-recognized measure. Thus GDP is used in a large variety of political and financial arenas. In absence of other widely accepted measures, GDP per capita also became a proxy for the well-being of nations. In historical context this is understandable since the variables that are behind GDP were of crucial importance in the build up after the Second World War. The need to introduce GDP at the time was clear cut, but GDP was never intended to be an accurate measure of well-being.”. The current challenges of our societies have moved substantially beyond those after World War II. Well-being is now an explicit goal of the EU. The European Union sustainable development strategy aims at the continuous improvement of the quality of life and well-being on Earth for present and future generations. The consensus on the use of GDP per capita as a good proxy measure of well-being is becoming less obvious also for economists, as the more developed societies move from a situation of scarcity to a situation of plenty. While GDP still serves the very purpose it was created for, namely measuring market activities in a consistent way, meeting the new challenges requires strong performance in additional areas that are not adequately picked up by GDP per capita.”. Complementary indicators are needed that are as appealing and clear as GDP but more inclusive of other dimensions of progress – especially social and environmental aspects. We need adequate indicators to address global challenges such as climate change, poverty, resource depletion and health.”. As an example GDP-derived measures as proxies for well-being take no account of leisure time. But leisure time is obviously of great importance to almost everyone’s well-being. In this sense, it is a ‘good’ that has a certain marginal utility.”. Several studies have been published over the last two decades on alternative measures of well-being, quality of life, sustainable development, and societal progress, all terms closely related to each other. A consensus has not emerged yet on the best way to go, but with the ‘Istanbul Declaration’ [in June 2007, note by author] (…) one can say that the need to go ‘beyond GDP’ is now fully recognized at political level.”. Many international organizations join forces with scientists to discuss ways how to move beyond GDP.”. The ‘Beyond GDP’ Conference: In November 2007, the European Commission, European Parliament, Club of Rome, OECD and WWF hosted the high-level conference ‘Beyond GDP’ with the objectives of clarifying which indicators are most appropriate to measure progress, and how these can best be integrated into the decision-making process and taken up by public debate. The conference brought together over 650 policy makers, experts and civil society representatives to address these critical issues. Preceding the main conference, an expert workshop was held, wherein leading practitioners discussed the development and application of indicators of progress, true wealth, and well-being.”. European Commission President José Manuel Barroso, in his speech opening the conference, highlighted that GDP is an indicator of economic market activity, but that it was not intended to be an accurate measure of well-being.”. That is because GDP is inappropriate to reflect many of today’s challenges, such as public health, climate change and the environment. We cannot face the challenges of the future with the tools of the past.”. President Barroso continued that we should aim for the kind of breakthrough that we saw in the thirties of the last century, a breakthrough that adapts GDP, or complements it with indicators that are better suited to our needs, and the challenges we face today. President Barroso concluded, It’s time to go beyond GDP.”. In the expert workshop preceding the conference, participants discussed different ways of addressing the key challenges in improving our measures of progress. Complementary indicators are needed, as opposed to ‘correcting’ GDP. There was widespread agreement at the expert workshop that GDP is not sufficient as an indicator of well-being. The majority of the experts attending the workshop supported the idea of complementary indicators.”. The call for complementary indicators comes not just from policy makers and experts, but also from the public. A survey (by GlobeScan) conducted in the context of the conference clearly showed that people want measures of progress that go beyond GDP: three-quarters of the people surveyed (in 10 countries including Australia, Brazil, Canada, France, Germany and Russia) wanted governments to ‘look beyond economics and include health, social and environmental statistics in measuring national progress’.”. Stavros Dimas, Commissioner for Environment, who initiated the Beyond GDP conference, summarized the main points from the Beyond GDP conference. He highlighted that there is a need for action to go beyond GDP to measure progress, true wealth and wellbeing of nations” and that there is political consensus on the need to go beyond GDP. Europe is committed to taking a leading role and working in partnership.”. Juergen Mohr was born 1968 in Nuremberg. Based on his studies of Physics that he successfully completed in 1995 with the degree Diploma, Juergen Mohr decided to improve his professional qualifications in the area of business administration and corporate management. From October 2006 to January 2009 Juergen Mohr graduated an international part-time MBA studies in General Management at the Georg-Simon-Ohm Management-Institute in Nuremberg with distinction and best graduate of the year. 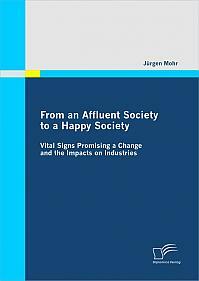 During his studies he deeply looked into the science happiness research, the sustainable development, and the societal change currently underway, summarizing his results in the book at hand. In his private life Juergen Mohr supports several non-governmental organizations focused on social justice and environmental protection.